Regulatory compliance creates big risks: regulatory risk, reputational risk, and even personal risks. This is increasing the demand for regulatory intelligence. Andrew’s extensive domain knowledge helps us understand the challenges and opportunities of regulatory intelligence. Whether your organization is local or global. Many overlapping layers of regulatory compliance can exist. To manage the volume, pace, and complexity of regulations Andrew recommends developing a regulatory taxonomy. “Having that commonality of terms, structure, and jurisdiction allows better more consistent communication across the business. Add automation and access to the taxonomy and you turn chaos into a competitive advantage. Automated data feeds and a consistent structure to the information are essential to regulatory intelligence technology. Best-in-class companies are turning to regulatory intelligence solutions to give them a competitive advantage. “If they can get ahead of the requirements, they can understand what’s coming down. They can begin to build products that allow them to get to market faster and provide a better solution for their customers. Regulatory intelligence solutions also help you identify global trends in regulations. You then adjust your business strategy and manage your risk — a much more proactive approach. Stay informed and watch the full hour-long video or select by topic from 27 short videos. 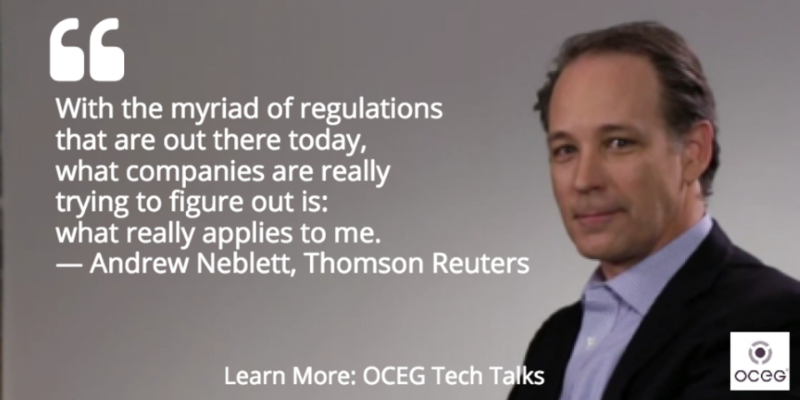 “Regulatory Monitoring and Intelligence,” is part of OCEG’s Tech Talk Series. The online videos explore GRC technology through interviews with solution experts. Visit the full series listing for more information.